*Note: This story appears in a shorter form in the spring-summer Matthaei-Nichols print newsletter. 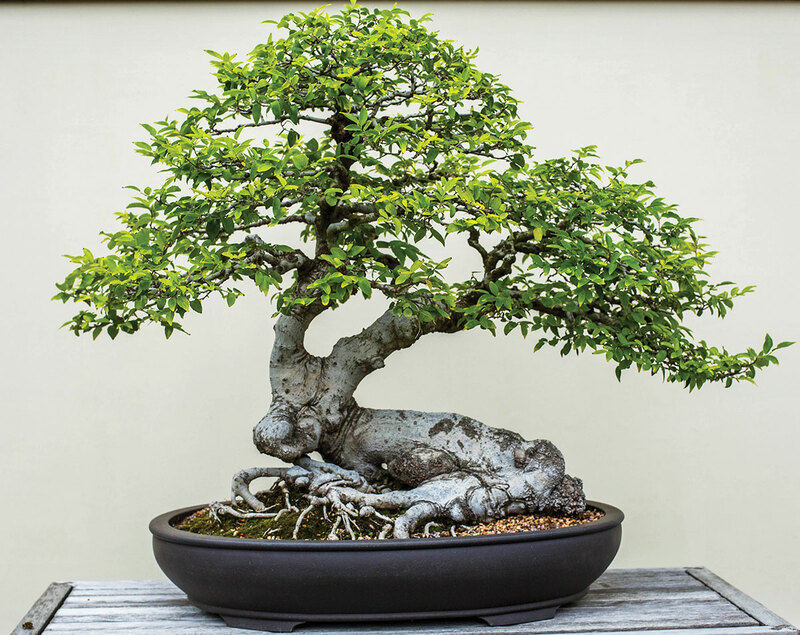 We asked four experts to share their thoughts on bonsai and what it means to them: Melvyn Goldstein, Jack Wikle, David Michener, and Carmen Leskoviansky. Scroll to read the complete story or click on the names below to jump to the individual sections. Dr. Melvyn Goldstein is a professor in anthropology and co-director of the Center for Research on Tibet at Case Western Reserve University in Cleveland. He is also a University of Michigan alumnus. In the coming years Professor Goldstein plans to donate his collection of bonsai to Matthaei-Nichols. 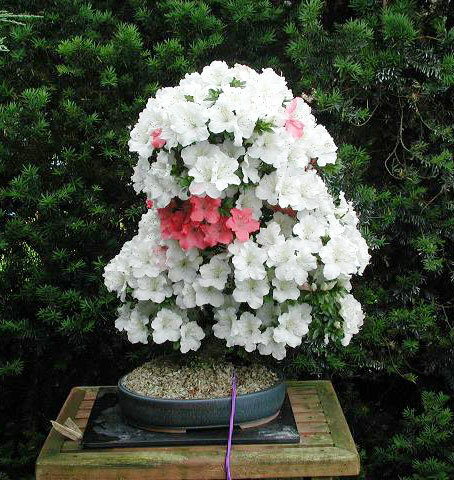 The collection includes several spectacular Satsuki azalea that bloom in June each year. 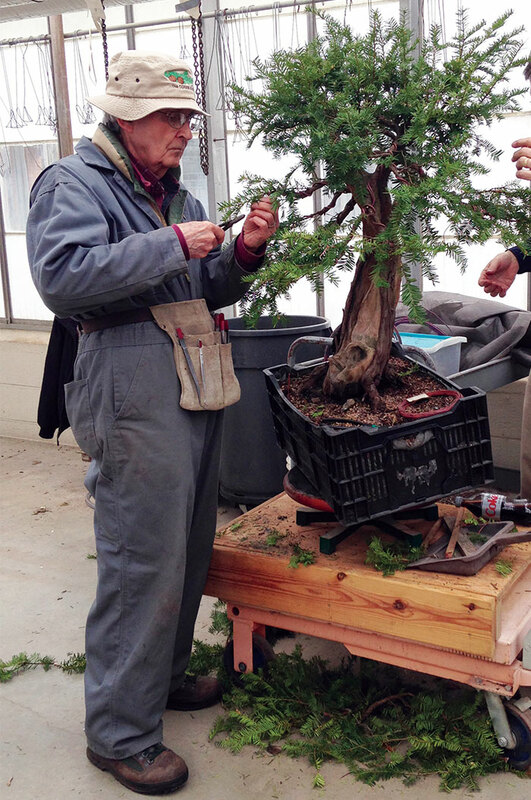 Jack Wikle is bonsai artist, teacher, and volunteer. 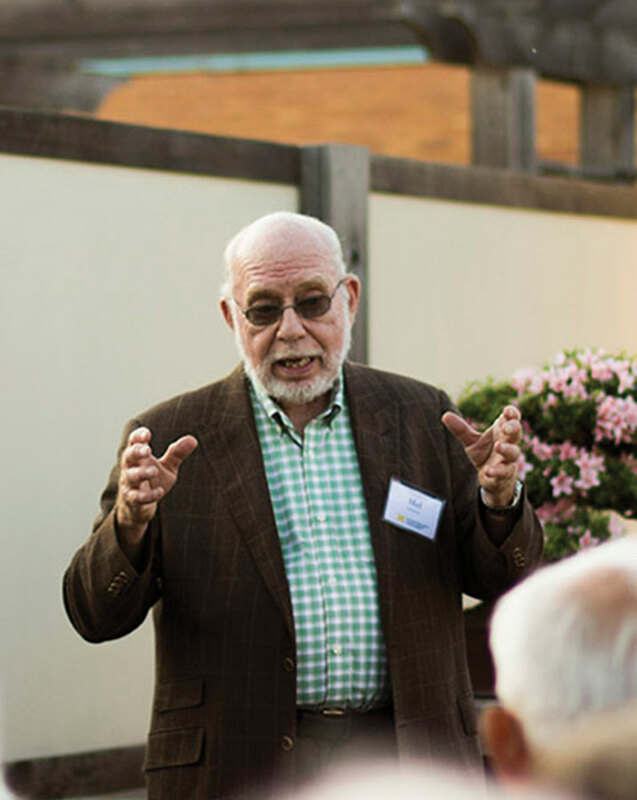 He is also a longtime member of the Ann Arbor Bonsai Society and a founding donor of the Bonsai & Penjing Garden at Matthaei. 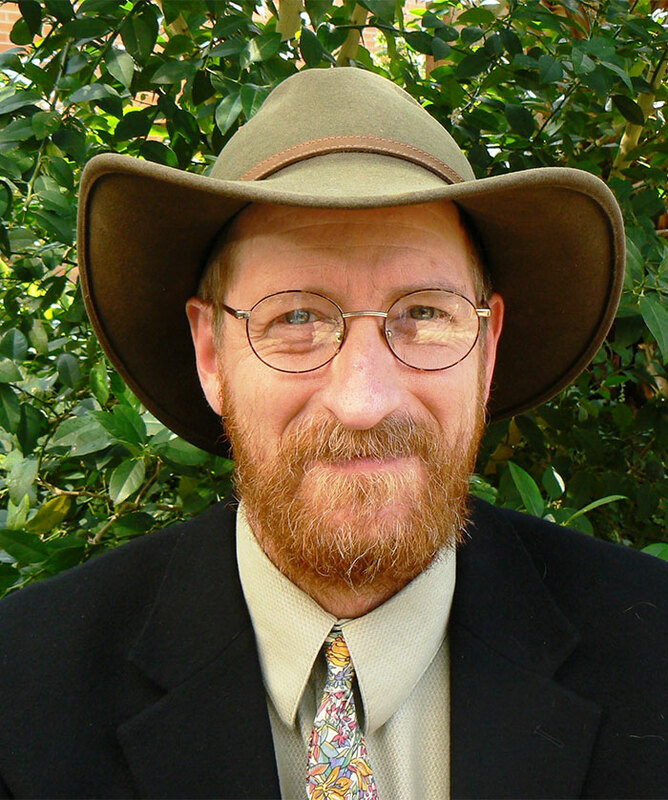 Dr. David Michener is the curator at Matthaei Botanical Gardens & Nichols Arboretum. David came to Matthaei-Nichols in 1990 and has been engaged with the collections and their broad use in the university community ever since. Carmen Leskoviansky began working at Matthaei Botanical Gardens and Nichols Arboretum in 2009. She oversees the care of the bonsai and orchid collections as well as the Gateway and Medicinal Gardens. Read on for what our experts have to say about the timeless appeal of an art that bridges cultures and generations. I first became aware of the art of bonsai when China opened up to research and I began to conduct fieldwork in Tibet in the mid-1980s. I would go to Lhasa through Beijing and happened to stay at a hotel that had a garden with beautiful bonsai, or as it is called in China, where it originated, “penjing” or “punsai.” I was greatly taken by the elegance and beauty of these trees, and started taking off a day coming in and going out from Beijing to look at penjing gardens such as the one at the Summer Palace. At the time I was living near campus in a house that did not have a fenced backyard, so there was no way to do anything about my desire to learn how to grow and style these beautiful trees. That all changed in 1995 when I moved to a new house that did have a fenced backyard. I started studying with a bonsai artist—who had a studio in Erie, Penn.—and buying my first small bonsai. But I realized immediately that the kind of trees I wanted were not the less-developed starter trees most people worked on, but the larger, older, advanced trees I was seeing in China. I wanted to work with trees with beautiful trunks like those I saw in China, so I decided to import them myself. Since I was traveling virtually every year to Tibet via Beijing, I got an import permit from the USDA and started finding all the bonsai dealers in Beijing and bringing one or two trees back with me when I returned home. Pretty soon I was as excited about going to China to hunt for bonsai as going to Tibet to do my fieldwork with a remote group of pastoral nomads. However the higher-quality Chinese bonsai are often very large, so while there were many trees I loved, I was limited to what would fit in a large TV box that I could take with me as excess baggage. In 1995 I started to make an effort to build a nice collection of Chinese penjing trees. I still have many of those trees, which were mainly Chinese elms. They needed a lot of work to refine the branches (shape) but it was exciting to try to improve them. (see attached tree photo of one of the earliest elm trees before and after). I’m not sure I have the very first tree I bought, but the elm tree in the photos is one of my very first Chinese elm trees. As you can see, hard to believe it’s the same tree. The wonder of bonsai is that you can create such beauty from raw stock. Usually once a tree reaches a relatively finished state the care shifts to maintenance, whereas with trees that are in development, the focus is on selecting which branches to keep, among other considerations. In the meantime I continued to attend the courses or programs offered almost every weekend in Pennsylvania and began to learn the methods that uniquely combine horticultural understanding and how to transfer an artistic vision into reality on a tree by pruning and wiring branches. Then, in 2000, a Japanese Satsuki expert named Tatemori Gondo gave a lecture-demonstration at a major bonsai symposium in Rochester. I had already been thinking about specializing in Satsuki azalea. After taking Gondo’s workshop I purchased my first Satsuki. That tree is now in the Mathaei collection (see photo). At the same bonsai convention I learned of a Satsuki azalea school in California that met several times a year, and where Gondo traveled to for each session. I had already decided that I wanted to build up a collection of Satsuki. I found the combination of plants that can be appreciated year-round and that bloom with different kinds of flowers unbeatable. Around 2002 I started studying with Satsuki Gondo san, and since then have concentrated on collecting Satsuki. At first I was buying trees that Gondo san had imported for El Dorado Nursery, but soon I started going to Japan to visit nurseries and pick my own Satsuki. USDA import rules were much tougher by then so these trees had to be shipped by air freight. Generally I went shopping with a friend I met at El Dorado, Dave Kreutz, one of the leading Satsuki experts in the United States. Gradually my collection—and knowledge—of Satsuki azalea grew. I started to improve the collection by buying exhibition-quality finished trees that already had a beautiful shape and required mainly fine-tuning and proper maintenance. Keep in mind, though, that trees are always growing and decisions have to be made about how to prune and what to keep. A lot must be done or a beautiful tree can turn into an ugly bush very fast. At the same time I started to buy what are known in the Japanese azalea world as aragi trees. These are plants that have been grown in the ground by a specialist for 20 to 30 years to create great trunks, but where many more branches have been left on the upper part. In this way the new owner can choose which branches to keep and which to remove to create the final shape. These trees are normally bought right out of the growing fields with their roots still bound up as a root ball. They are basically high-quality raw material. So my large collection of high-quality Satuski developed this way over the past 15+ years. In more recent years, I’ve also grown deeply enthralled by a style of bonsai called shohin, where the trees cannot be more than 8″ tall (measured from the soil level in the pot). In this case the defining feature is not the type of tree—for example azalea versus elm—but its size. Satsuki are special for me because of the unique combination of large trunks and shapes with the added bonus of a range of many different-colored flowers, often with two to three flower colors on the same tree. There are hundreds of different flower colors and shapes. They are also easy to develop because they are vigorous growers and back bud easily. I have cut off all the branches on trees in order to start again and have been able to create a beautiful tree in 4-5 years. Many Satsuki collectors try to obtain trees with specific kinds of flowers, but my interest was also to get the best shape tree I could find. I was looking for potential bonsai beauty, not flower beauty. For me the flowers were and still are a wonderful bonus each year. Then as I thought more of my trees as a collection that would go to Matthaei, I started to select high-quality trees that represented the main styles of Satsuki bonsai—for example exposed roots, clump, cascade, root over rock, raft, and others. Overall, though I have maples, pines, junipers, etc., my collection has become focused on Satsuki and shohin trees, and of course, the group of Chinese elms I obtained in the early years. For me the real sense of accomplishment is not just seeing a group of beautiful trees in my garden. It’s also about going back in time to recall what the trees looked like 20 years ago. In most of the cases the trees have been transformed. They are truly a kind of ever-growing art form. Usually when you have basically finished trees such as mine, you are trying to maintain their beauty and keep them healthy. But even with trees like these, there are always problems like a branch or part of a branch dying that requires work to adjust the overall shape. But normally, for plants at the stage of my trees, the aim is to maintain the beauty. This is much harder than it sounds! My involvement with bonsai evolved from graduate studies in the history department at the University of Michigan with Professor Andrei Lobanov-Rostovsky, an expert in the history of Russia in Asia during the Czarist period. I was specializing in Russia and Mongolia and would certainly have stayed at Michigan had not Professor Lobanov retired in 1960, the year I received my master’s. The department had not decided if they would replace him with a Czarist or Soviet scholar, so Professor Lobanov told me to take a year or two off and study the Mongolian language at the University of Washington with Professor N. Poppe, a Russian emigré friend of Lobanov’s who was also one of the leading Mongol scholars in the world. The plan was to see what happened with the history department at Michigan and then decide where to do my Ph.D. Professor Poppe welcomed me to study with him, so in the summer of 1960 I drove out to Seattle and was about to start at the Far East Institute at the U-W when they urged me to join their brand new program on Tibet. The Rockefeller Foundation had funded centers in eight countries so they could set up programs to train young scholars to study Tibet with the hope of being able to save Tibetan civilization. At U-W, which had the best foundation for this in the United States, two professors could read Tibetan but neither could speak it nor could they read a newspaper. And there were no textbooks for the language. But there were living Tibetans so we basically learned by interacting with them. It was stating at the ground floor. The reason for this was that the Dalai Lama had fled to exile in India in 1959 after a failed uprising, and the Chinese then ended the traditional society, including monasticism, so the world thought that Tibetan culture might be on the verge of being lost. The U-W had been awarded the Tibet Center program in the States and so had recruited five Tibetan refugees from India to come to Seattle to help with the teaching and so forth. That sounded exciting so I joined the first cohort that fall and started studying Tibetan along with Mongolian language and culture and soon decided to specialize in Tibetan studies, working both in the anthropology and language departments. However, my love of history was always present and over the years I continued to research Tibetan history and have published a lot on it. In fact, I am just finishing (March 2019) the fourth and final volume of my History of Modern Tibet series (published by the University of California Press). Thus, my bonsai activities and collection indirectly derive from my studies with Professor Lobanov and his sending me to study Mongolian at U-W. I really think of it that way, so I was very receptive when Matthaei-Nichols contacted me about the Penjing and Bonsai Garden. I’m proud to be able to return something to U-M for all that it has done for me academically and for bringing bonsai into my life. A Satsuki azalea in bloom, collection of Mel Goldstein. 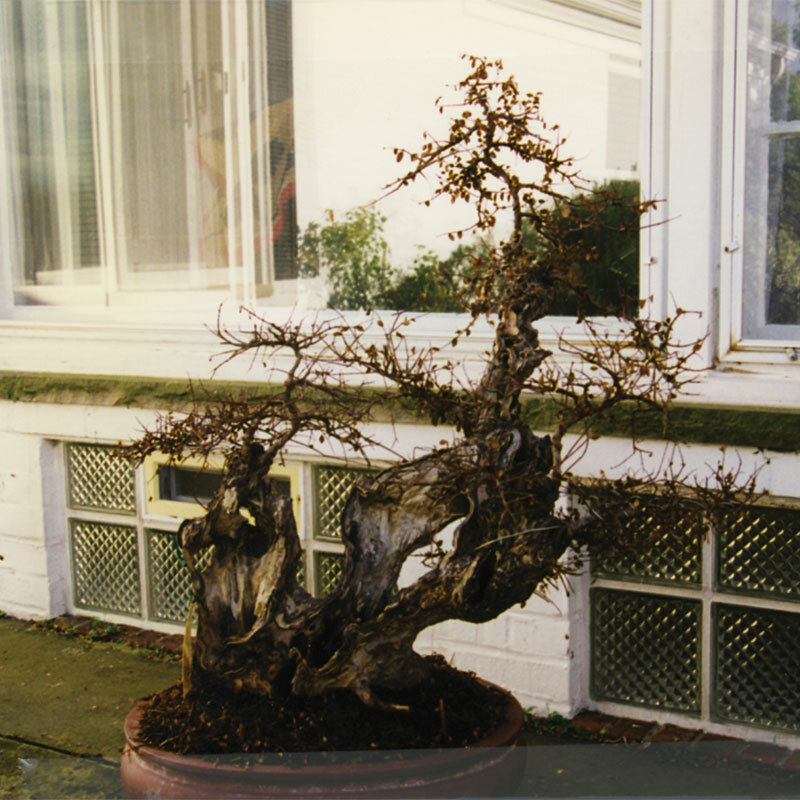 A Chinese elm purchased by Mel Goldstein as it appeared in 1997. The same Chinese elm in 2011, 14 years later. A Satsuki azalea in Mel Goldstein’s garden show the striking variation of bloom color that can occur on the same plant. Accepting this kind of thinking allows us to speak of bonsai as an ancient art form combining creative activity (styling) and the pleasure of nurturing living plants, an art form that originated in the Orient more than 1,000 years ago and is now practiced around the world wherever trees can be grown. Of course bonsai is different from arts like painting and sculpture in that it is never finished; change in the tree and the close involvement of the grower go on and on. 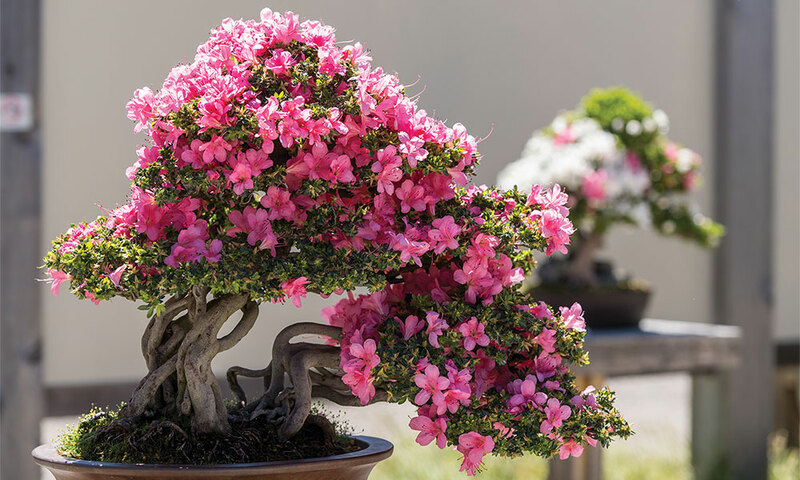 This has led some people to refer to bonsai as “living art” or as “living sculpture.” Others have even called it living poetry (in China, “poetry without words” is an expression often used). So, it is in this sense that I and many others are comfortable in thinking of bonsai as art. As is true with other arts, there will always be some bonsai more successful, that is, more effective, than others. Never-the-less, even the modest and unassuming beginner’s effort can be rewarding to the grower. 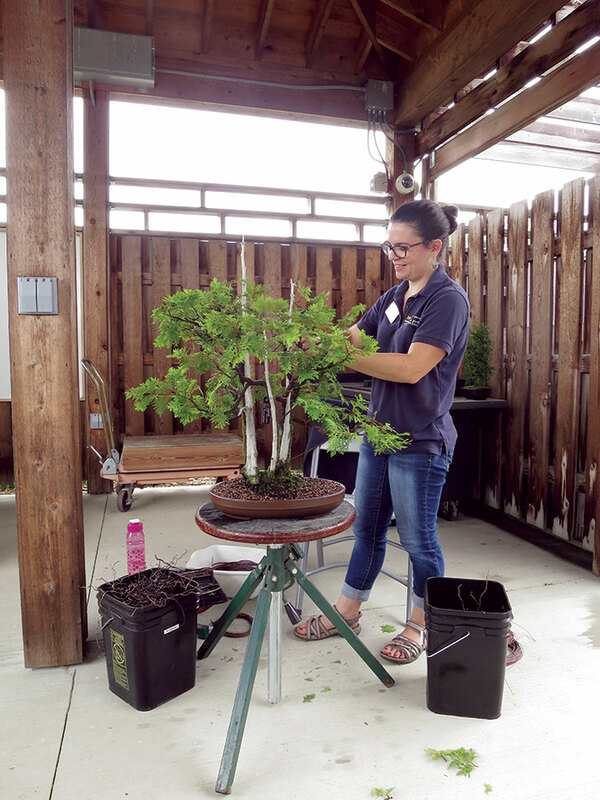 Growing bonsai is one of those activities like building sand castles, swimming, or playing piano that can enrich lives practiced at many different levels of accomplishment. And, if its grower likes it, the likelihood is very high that someone else will find pleasure in the beginning bonsai too. Japanese bonsai growers in particular have been prone to speak of successful bonsai as communicating “wabi” and “sabi.” These are terms coined centuries ago by Zen Buddhist tea masters to express difficultly defined and very complex aesthetic concepts. Basically the originators of the Japanese tea ceremony disdained striving, ostentation, and luxury while promoting quiet pleasure in the beauty of nature and the subtle beauty of commonplace objects — especially objects of lasting quality that have acquired the patina that comes from long use. Use of simple things in refined ways—using minimal material in making a cosmic statement—has long been a hallmark of Japanese art. And, it seems clear that the Japanese continue today to hold bonsai and the tea ceremony, among other arts, in high regard for their value in bringing people together in harmony—in promoting mutual understanding, peace, and goodwill. Unquestionably the art of bonsai has at its foundation an appreciation of trees and of nature and of the cycles of nature. Yet, beyond being the grower’s statement about trees and nature, bonsai also say something positive about interaction between man and nature—about taking pleasure in the interaction between humans and nature. After all, bonsai, like gardens, are not the product of people working in isolation from nature nor are they nature’s creations without man’s involvement. Gardens and bonsai come into being, by definition, when people and nature work together. At another level is the impact of bonsai culture as quiet physical and mental therapy for the grower. Among my longtime bonsai friends, Eunice Corp stands out for having expressed to me many times the rewards she finds in bonsai work as peaceful but intently focused meditation. (Eunice summers in Cadillac, Michigan and winters in close contact with the bonsai community in Hawaii.) As a painter and a flower arranger as well as a bonsai grower, Eunice is active and conversant in many arts. She tells me that much of what she does in her painting and bonsai styling involves a conscious, even purposeful, shift from “left brain” to “right brain” activity, from being analytical to being open to the creative and non-verbal levels of her being. Eunice has wondered in our correspondence how many other bonsai hobbyists realize that this kind of experience and the kind of pleasure she experiences from it can be purposefully accessed by arranging to work in a pleasant setting isolated from distractions with soothing music playing. Eunice tells me she is not suggesting “transcendental meditation like that used for stress reduction.” Yet it seems unquestionable to me that stress reduction meditation and Eunice’s bonsai activity, in which she divorces herself from outside concerns while focusing on her music and the styling of her bonsai (in contrast to endless re-examination of the past and uneasy anticipation of what the future may bring), have a great deal in common. Actually, stress relief meditation and Eunice’s bonsai work both seem clearly to be “flow” activities as described by the psychologist Mihaly Csikszentmihalyi in Flow: The Psychology of Optimal Experience, his thought-provoking book from 1990. Flow activity as characterized by Doctor Csikszentmihalyi involves deeply focused and unselfconscious concentration on the work at hand, detachment from unrelated concerns, and distortion of one’s sense of time passing. Its result is a deep feeling of personal fulfillment. In the flow experience, the sense of personal growth and satisfaction comes more from effort and depth of involvement than it does from the effort’s product. Yes, one can say that the bonsai enthusiast, the bonsai artist if you will, helps trees grow but most of us recognize that the reverse of this statement is more accurate. Our trees are helping us grow. Bibliography: 1964, Book by George Hull, Bonsai for Americans. 1990, Book, by Mihaly Csikszentmihalyi, Flow: The Psychology of Optimal Experience. 1992 (Summer), Article by Kay Cheever, “The Tableau of Bonsai,” Bonsai: Journal of The American Bonsai Society, Summer. 1994 (Spring), Haiku written by Alice (“Happy”) Slocum Wright while participating in bonsai classes taught by the author at Matthaei Botanical Gardens. 1997, Book by Quingquan Zhao, Penjing: Worlds of Wonderment. This article first published as a May 2005 AABS Newsletter column and, subsequently, republished in the Winter 2006 issue of Bonsai, quarterly Journal of The American Bonsai Society. Bonsai and penjing are deeply rooted in centuries of contemplative spiritual discipline. Contemporary eyes may also see them as a kind of performance art. But what is the performance about? And for whom? And does it matter? My first exposure to such questions was at a penjing studio in Jiangsu Province in the early 1990s. The studio master was working on vertical penjing (that is, the dish is mounted on the wall, and the trees grow from the crevices in the rock dish). 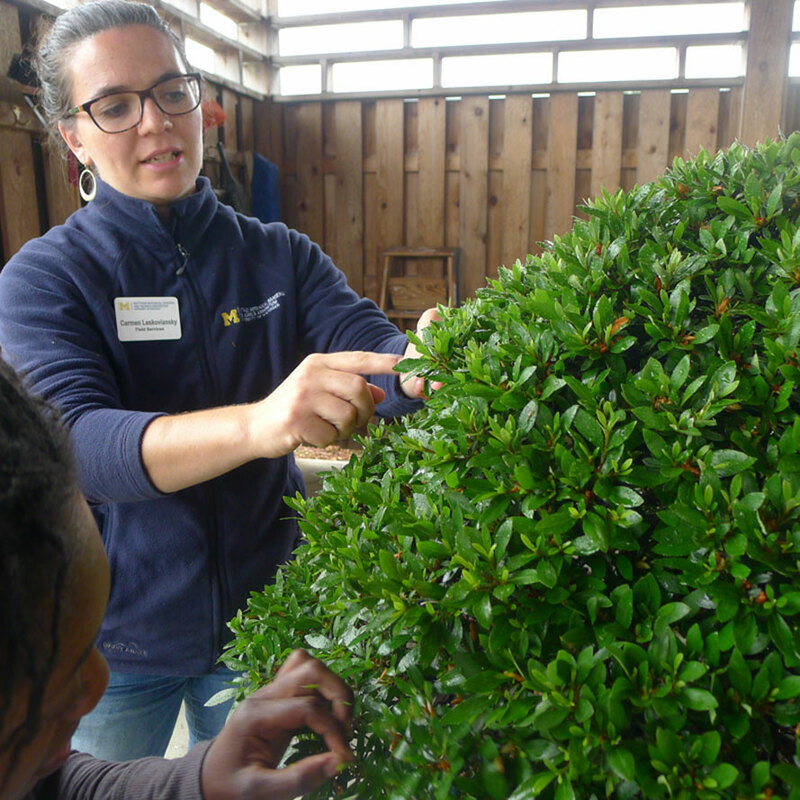 The teaching included that penjing (and bonsai) can be about human’s role in nature— distilled to within our grasp. In China, the presence of mountains, water, and plants is required. Yet for millions of Chinese who toil in cities, it is often quite difficult to find these ancient roots of resonance and identity. Yet with this simple dish—intentionally adapted for an urban apartment balcony and needing at least daily misting, one’s mind could travel. From that day forward bonsai and penjing have been freed from my Western mind’s philosophical trap of “what does it really mean.” Instead of being a way to one true understanding, I have come to understand bonsai and penjing as nuanced expressions and explorations of layered relationships. Nature to humanity; master to apprentice (when is the tree the pupil, then the master? ); youth to age but in such a way that we humans will always be the youth however advanced in years. 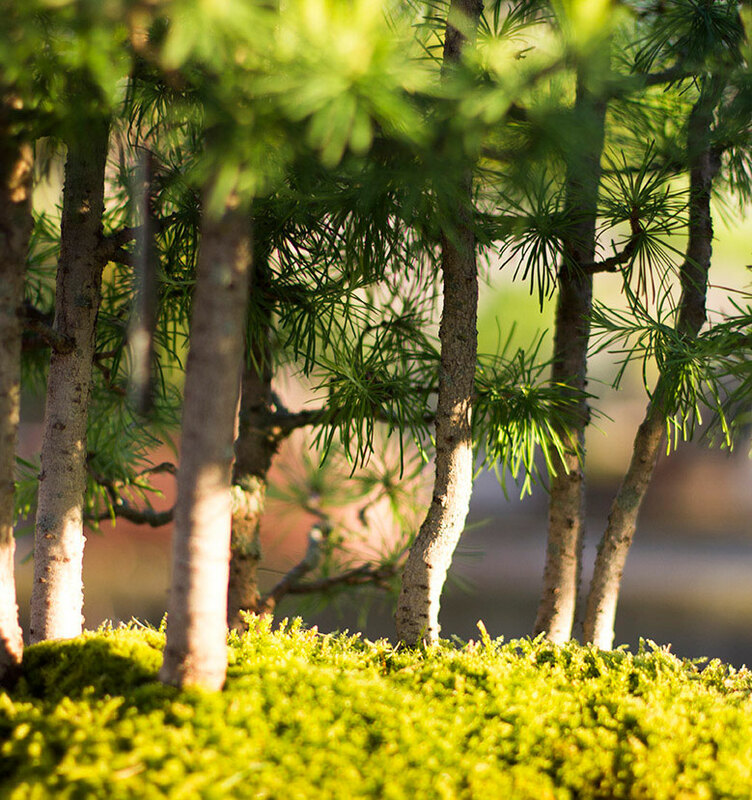 From this perspective, bonsai and penjing are about profound learning— and ultimately arriving at a level of mastery of life’s challenges with grace, dignity, and scars that hint of the untold struggles. Bonsai is now an international art form, respecting its Asian roots but now adaptable to any human culture and context worldwide. For Matthaei Botanical Gardens & Nichols Arboretum, having Dr. Goldstein’s profound range of canonical pieces entrusted to us provides the context and gravitas out of which our contemporary American pieces continue the deepening cultural expression. Go see for yourself. A bonsai tree donated by Mel Goldstein. The trunk is in the shape of a forest creature, with the antlers becoming the tree canopy. 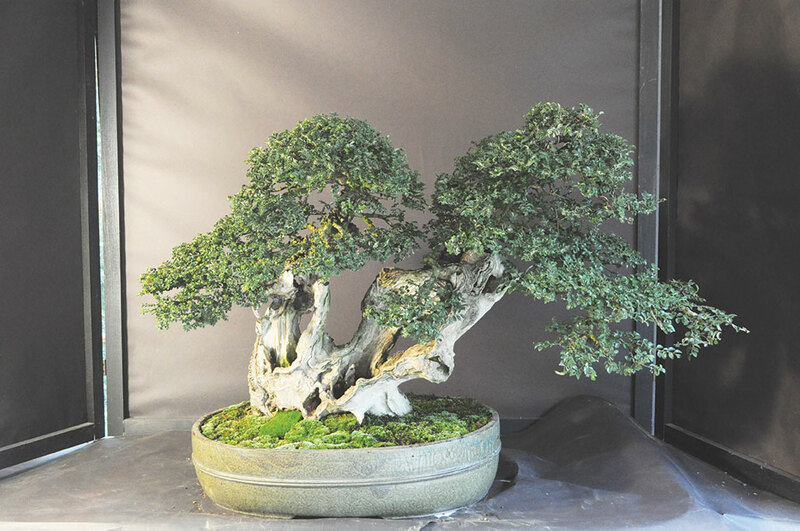 Bonsai in the West, including the United States, is still a young art compared to the thousands of years it has had to grow and evolve in the East. Many early bonsai practitioners in the States began as hobbyists with very little formal training using anecdotal evidence to grow their trees. As a result, many of these trees fell short of the ideal bonsai structure and lack the refinement found in Japanese collections. Yet this speaks to the American spirit of jumping fearlessly into the unknown and remains an important cultural milestone in the evolution of bonsai in the United States. With the return of an increasing number of American bonsai apprentices from their time studying in Japan comes the skills and techniques needed to create high-quality trees. Additionally, since the rise of the internet, more information is accessible to all levels of bonsai artists than ever before. Today in the United States there’s a new crop of American bonsai artists and teachers, some rising stars, some seasoned artists. People such as Ryan Neil, Bjorn Bjorholm, Bill Valvanis, and Michael Hagedorn, to name a few, demonstrate the growing American presence in the world of bonsai. I fell accidentally into the world of bonsai. As a trained horticulturist with some background in art, the care and styling of bonsai—watering, fertilizing, repotting, pruning, wiring, design—came easily. However, there is only so much one can achieve without the dedicated study of the Japanese traditions of bonsai. I’ve had the opportunity, working with the collection at Matthaei-Nichols, to host various bonsai professionals who have trained in Japan. Each session is not only beneficial for the trees, whose designs are elevated, but for me and our volunteers. We learn new techniques, and maybe more importantly, the why behind these techniques. As there is no peer-reviewed literature on the science of bonsai, one must extrapolate from horticultural research why these things work and experiment to discover new techniques and methods for growing. It is much easier, then, to have a professional who already understands the why and how to share that knowledge than to relearn from scratch. In 2018, I began studying with Michael Hagedorn, a professional bonsai artist in the Pacific Northwest. Michael apprenticed for 3 years in Japan with bonsai master Shinji Suzuki. This training has solidified much of what I already learned while imparting the methods of traditional Japanese bonsai. The Seever’s bonsai collection, donated to Matthaei-Nichols in the late 1970s, reflects the evolution of bonsai in America. Many of the trees originated as nursery stock or collected trees and were developed out of the love and passion of the work. Once they came to us, they became a community project, with the work of many volunteers being documented and visible over the years. More recently, together with professionals such as David DeGroot, Bjorn Bjorholm, and Suthin Sukosolvisit, I have worked to restyle or refine these pieces to fit a more formal aesthetic. With the incoming donation of high-quality trees from Dr. Melvyn Goldstein, the Matthaei-Nichols bonsai and penjing collection will transform from a collection built mostly by local enthusiasts to one of the leading public collections of bonsai in the United States. It will serve as a mechanism to compare and contrast the American spirit of bonsai in the evolution of the original Seever’s collection, with the refined collection of both imported and endemic species of American bonsai collector and artist Dr. Goldstein.